Take Your Indoor/Outdoor Dinners To A Whole New Stylish Level! The Ultimate Disposable Tablecloth Has Just Been Released! Tired of scrubbing oily stains from your expensive wooden table after the Sunday barbecue? Have you had enough with cheap disposable table covers that get ripped in a breeze? Looking to protect your kitchen, patio, cocktail or formal event table from ugly spills? At Clearly Elegant we have designed the sturdy, long-lasting plastic table cover you're looking for, to cover any of your indoor and outdoor tables with style! Say Hello To A High-End Table Cover, Adjustable To Your Table Size! Larger than most similar table covers available and ULTRA durable, this 100' X 52" (423 sq ft) makes the perfect kitchen/garden/patio/camping tablecloth. Coming with an easy to use SAFE CUTTER, it can be cut to the size you need, to make the ideal picnic/beach/pool table cover, to add color and style to your refreshing outdoor adventures! Make Your Special Event Pictures A Bit More Colorful! Eye-catching, fresh, youthful and modern, it is the perfect table cover for your wedding reception, the birthday party of your little angels, as well as the crazy bachelor, bachelorette or graduation party. It perfectly complements your festive décor, creating the ultimate setting for your vibrant pictures! Stop wasting time and energy on washing tablecloths after the family reunion or the special event dinner! Just roll up your disposable table cover, toss it in the waste bin and invest the extra free time in things that matter most! Get Yours Today Absolutely Risk-Free! 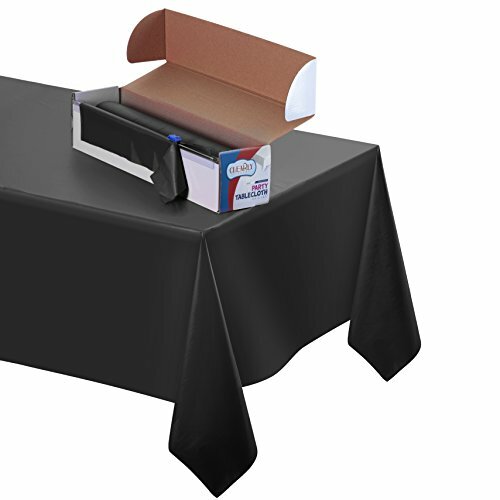 PROTECT YOUR TABLE FROM STAINS with a large plastic disposable tablecloth 100' X 52" (full 423 sq ft) that will add a touch of elegance to your daily or special dinner! It is a rectangle table cover in the ideal dimensions to cover any table with style, the perfect indoor/outdoor tablecloth for home, the Sunday barbecue, the pool party, the beach dinner and the picnic. CUT YOUR TABLE IN THE SIZE YOU NEED, to ensure perfect fit on your table! At Clearly Elegantwe know you ́re looking for a perfectly fitting table cover, this is why we accompany our dining table cover with a handy SAFE CUTTER, to allow you to cut it easily in the right size. Cover any table with an eye-catching kitchen/patio/wedding/graduation/birthday table cover! STURDY & LONG-LASTING! Worry no more that spills of your charcoaled ribs or juicy burgers will leave persistent greasy stains on your wooden or marble table! This heavy-duty tablecloth is sturdy enough to ensure safe protection for your table, wipeable for your convenience and durable to outlast your dinner. Get the sturdiest disposable tablecloth on the market! PERFECT FOR YOUR DAILY OR SPECIAL DINNERS! Stylish, colorful and classy, this large plastic rectangle tablecloth will take your festive table to a whole new level! Adjustable to your table size, it makes the ultimate family reunion, buffet, wedding, bachelorette, graduation or Christmas party tablecloth and an excellent table cover for the kids' birthday party. YOUR 100% SATISFACTION IS GUARANTEED! We take great pride in the quality and manufacture of our disposable table cover and we're sure you'll love it! This is why we back it with 30-DAY Money Back Guarantee and warm Customer Service, to help you buy with confidence. So, place your order in peace of mind as you have nothing to lose! If you have any questions about this product by Clearly Elegant, contact us by completing and submitting the form below. If you are looking for a specif part number, please include it with your message.